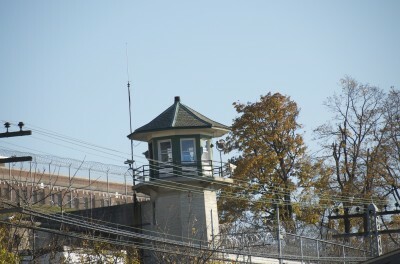 Some years ago on a field trip with other mystery writers I visited the Sing Sing Correctional Facility. I took the Metro North Train from Grand Central Station to Ossining where the facility is located. 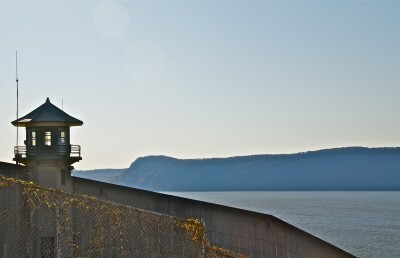 Sing Sing is the only prison bisected by railroad tracks, and a few minutes before the train pulled into the Ossining station, I got my first view of the Correctional Facility, with thick rolls of razor wire stretched across the top of the immense granite walls. 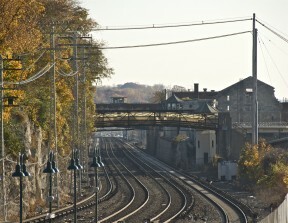 I’ve since learned that there are four Sing Sing Correction Facility bridges that cross over these tracks. The northernmost bridge outside of the secure perimeter is a pedestrian crossing for employees. There is a bridge for utility lines, a secure pedestrian bridge for transporting inmates from one side of the prison to the other, and then there is a secure vehicle bridge used by maintenance, shuttle busses and delivery trucks. Once I got off the train I had a two-minute taxi ride, a short walk through the parking lot and then I stood at the entrance to one of the most notorious prisons in the USA. After everyone was given a thorough security check, and an introduction and brief history of the prison, we were taken on a two and one-half hour tour of the facility. Sing Sing derives its name from the American Indian tribe “Sint Sink” that used to live in the area. It’s quite possible that the translation of the tribe’s name is “stone upon stone” or “place of many rocks,” which aptly describes the rocky terrain that the prison is built upon. The first prison in New York was built in Greenwich Village in 1797. A second facility constructed in 1816 was called Auburn State Prison. Then in 1825 the New York Legislature appropriated funds to build a more modern prison. The site chosen was a 130-acre stretch of land thirty-three miles North of New York City. This property offered a rich quarry, which would provide materials for building the new prison, as well as, for long-term productive prison labor. The prisoners lived in tents while building their jail, stone by stone, chopping out the granite rock from the surrounding area. The prison when completed would measure 476 feet long and would stand four tiers high. Each cell was to be 7’ deep, 3’3” wide and 6’7” high. By the winter of 1826 the prisoners had completed 60 of the 800 proposed cells and in 1828 the construction of Sing Sing was finished. Until the turn of the century prison labor was used to cut stone from the property and to provide blacksmith work fulfilling contracts made on the outside by the commissioners. In 1943, the old cellblock was closed and the metal bars and doors were donated to the war effort. 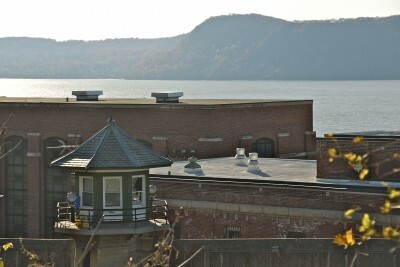 The Sing Sing Correctional Facility is much larger today and now houses 1,800 prisoners, with approximately 900 employees. 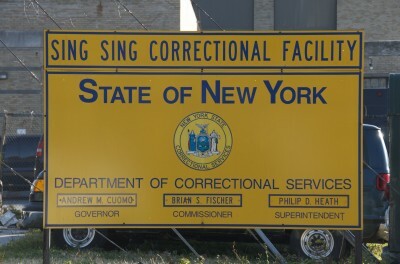 Though Sing Sing is a prison that services the entire State, 77% of the inmates are from New York City. In 1989 Sing Sing became accredited by the American Correctional Association, which holds the prison responsible for 437 standards. These standards cover every aspect of the facility, from health care, security and safety, to business office and housekeeping, and addresses inmate programming and custody issues. These standards also mandate that the staff be well trained. ACA returns every three years to insure that these standards have been maintained. The Sing Sing Correctional Facility contains two major cellblocks, A and B. Cellblock A is as large as two football fields placed end to end and houses 800 men in three tiers. Cellblock B is not as wide as Cell Block A, and stands four tiers high. These two cellblocks feed into a hub, a huge kitchen, where two separate dinning halls then fan out at opposite ends of the food preparation area. The men eat all of their meals in the dinning room in ten-minute shifts, and the ten-minute shift promptly begins once the first man in the group sits down. We walked through one of these dining halls during a lunch session and saw the prisoners eating hot dogs, squeezing mustard from little plastic envelopes. At first glance, it looked no different from any other large dining hall. There was a difference though. Each prisoner, as he enters the eating area, must pass through a metal detector and a correction officer stands at the entrance to the area handing a spoon to each inmate as he walks through the doorway. More guards are posted throughout the hall, and we were told that if there were to be trouble it would be during a meal time. Men who have earned special privileges by their good behavior are housed in a separate section of the facility. These men have unlocked cell doors during the day and are allowed to move about freely within this restricted area. There is a two-year waiting list to get into this wing of the prison. If someone gets into trouble while waiting their turn, they are removed from the list, and must begin all over again to work their way back into the good graces of the prison authorities. It is not a privilege that is taken lightly. This is also the location where the 1938 James Cagney movie, Angels With Dirty Faces was filmed. In one area of the facility we visited there was a long corridor with rectangular windows constructed too far off the floor to look out from. We made a sharp turn and found ourselves in a long windowless walkway lit only by candescent bulbs covered in wire cages, the walls looked so thick it felt as if we’d gone deep into an underground tunnel. Some passageways we were taken through seemed to go on for blocks and blocks, twisting and turning, with stairways that went up, then down, as we closely followed our guide through the maze of locked gates with guards everywhere. Returning to our meeting room at the end of our tour, we passed an outdoor area enclosed by a heavy gauge wire fence and covered by a tarpaulin, where prisoners graduating from a GED program were preparing for a celebration. Our guide for the day wanted us to know that the prison system has changed greatly since the 1971 Attica riots. He assured us that there are policies in place now, procedures and programs to insure there is fairness for all inmates and that the days of closed prisons are over. Now prisons are linked closely with the outside world. Training for employees is an intense eight-week program that covers areas such as communication skills and law. The main focus of the training is to teach employees to rule by leadership, not by intimidation, and to be firm, fair and consistent. The South-bound Metro Train heading back to NYC did not pass through Sing Sing, but instead the tracks made an abrupt turn and ran closer to the shore of the Hudson River. Boats used to bring inmates up this river and unload them at the door of what used to be called “the big house.” The dock was closed many years ago. The original outside walls of Sing Sing, built by the first inmates of the prison, still stand, a site preserved as a historical monument. We saw those vacated old granite walls, ruins now, and a home to feral cats and twisted brambles. Oh, if those walls could talk, what stories they would tell.